Kip Hering graduated from Geological Sciences at SDSU in 1962 and went to work in the petroleum industry the following Monday. He was one of four students former Department Chair Baylor Brooks sent to the National AAPG meeting that year, and Kip’s first job was a direct result of attending that meeting! 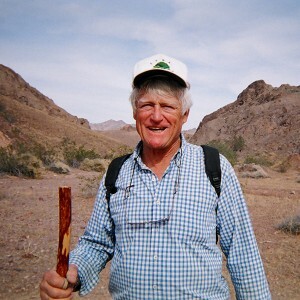 Kip went on to an adventurous and hugely successful career working around the globe with Occidental Petroleum before returning to SDSU in 2007 to spearhead the Department’s petroleum geology program. Kip’s forty-plus years of experience in petroleum exploration and production, combined with his energy, enthusiasm and remarkable skill as a teacher has had a major impact on the program via his Petroleum Geology course, and his mentorship of our student teams entering AAPG’s Imperial Barrel Award (IBA) competition. An important part of Kip’s approach in preparing students for successful careers are the class trips he leads to California oil fields, company offices and governmental agencies. In honor of Kip’s enormous teaching contributions, the Department is excited to announce the ‘Student Field Experiences’ Fund that will enrich the educational experience of students by supporting ‘high impact’ learning experiences, which include attendance at professional meetings, short courses, participation on field trips organized by professional societies, governmental organizations or others, and also field trips organized by the Department as part of a class or research project. These funds will be allocated directly back to students in the form of travel reimbursements. We need your help! The first $50K raised for our students will also enable us to establish in perpetuity the ‘Kip Hering Energy Resources Laboratory’ where students will gain practical skills using state-of-the-art industry software and equipment. With generous contributions from Kip and Suellen Hering, Chevron, ExxonMobil and the Lehtola family we are already half-way to this goal! Our plan is to host the inaugural opening of the Hering Lab in Spring 2015, and continue to build this fund to $250K over the next five years. For alumni with employer matching please consider becoming a sustaining contributor via automatic monthly contributions.